Bridge of Spies takes place in 1957 and is based on the true story of James Donovan, a high-profile New York lawyer who took on the case of an accused Soviet spy named Rudolf Abel. Directed by Steven Spielberg, the film has a way of making us question whom we should vilify as an enemy and the character of those we call friends or allies. Should rules be kept for rules’ sake or are they the means to an end to a better, more ideal life where common sense must prevail? Is the letter of the law greater than the spirit of the law, or vice versa? No matter how you phrase is, there is simply no way to watch Bridge of Spies and not ask that question. Tom Hanks owns his role. Everything, from the things his character says to the way in which he interacts with his children and IRS agents alike bear testimony to Hanks’ skill and Spielberg’s wit. Hanks made the movie what it is, but not by himself. In the movie, Donovan is just an ordinary guy. He has a loving family. He enjoys every little aspect of what it means to be alive. He respects all people, even those esteemed to be beneath the dignity of human beings (as communists were in cold-war 1950s America). But Donovan is also extremely smart, and as he appeals to reason, people listen when he speaks since his ego takes a back seat to prudence. When he is thrown the unwanted task of defending Abel, he tries to dodge it, but when he finds that he cannot, he owns up and gives it his best. It is then that everyone around him, from family to strangers to co-workers, stare him down in disgust. None of the frustration from any of that is passed along to Abel. He manages to develop a strong rapport with this spy everyone hates. Abel, who is played with the finest of understated passion by Mark Rylance (The Other Boleyn Girl), lets his character’s hopeless situation out by resigning to do the one thing he can do—sit and wait for sentencing. The two men study each other, but all they see and know for sure is that they are both being genuine by being who they are and what life carved them out to be. When an American soldier is capture, the CIA steps in and asks Donovan to negotiate a prisoner exchange for Abel in Berlin. There is just one problem with that: Donovan must go to East Germany and make the exchange as a private citizen, without any government support whatsoever. He has no experience in such endeavors, but he has several things going for him—his intelligence and his strong sense of genuineness. Of course, things only get worse when he arrives. Another American student complicates the exchange. The tensions, along with the stakes for two counties, keep rising. And that is what – together with the remarkable craft of the movie as a whole – makes it such a superb viewing experience (a few poor supporting characterizations notwithstanding). There is some fabrication here and there for effect, but most of it stays right in line with the real account. In terms of recreating the time period, things are likewise excellent. 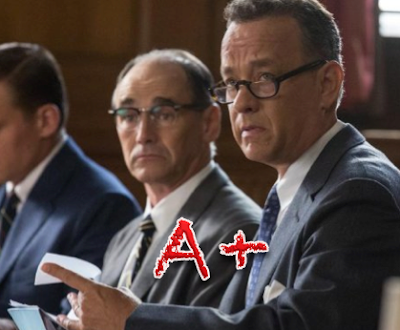 Fears of a nuclear holocaust, scared young servicemen preparing to take covert missions…it’s all in the mix of what makes Bridge of Spies such a spectacular time at the movies.